Happy Monday loves! Hope you had a great weekend. I'm writing this during my first week of wedding vacation so it's super nice to be home today! Wedding week is officially here and we have just been doing a few last minute things like putting together our welcome bags, wrapping gifts for our bridal party, etc. I have a few appointments to get my nails done and an airbrush spray tan! I'll definitely let you guys know how it goes. I've done spray tans in the booth but have never had the airbrush tan before! A little risky doing it for the first time on wedding week but this place has awesome reviews. Would love to hear if you guys have had a good airbrush tanning experience! These pants are NECESSARY for your office wardrobe. They're obviously super cute to wear casually too but I love them for work. They're SO comfortable and they look super chic/put together. They come in a few other colors and I really want them in blush--obviously! Ahhh I love these pants! I saw them on Rachelle and thought they looked so great. I might need them. AH! I am in love with this look on you! Those pants are seriously SO FAB! Sassy and classy and you are BEAUTIFUL!! Happy Monday! I love the neutral tones of this outfit, it's so simple yet so chic and cute! Love love love those pants! I would totally rock those at work! You look so chic! I love how simple this look is and it really does prove that less is more! How exciting that wedding week is here! Enjoy. I love how you styled those pants! Super cute with those shoes. I love the trousers and the sandals. I have black ones like them. They are perfect for spring. I am so obsessed with this look Kelly! Those pants look super comfy, and I love how they're balanced out with the fitted top. I so need to make my way over to express, you look gorgeous! Totally pinning this! Yay for wedding week!!!! One of the most exciting (and slightly stressful) weeks of your life! One recommendations for the spray tan, dont over do it. I thought the darker I do it the longer it will last through the whole weekend, not the case! Just do a more natural color and one that wont rub off on all your wedding attire. AND these pants are so perfect for the office! I am all about the comfort! 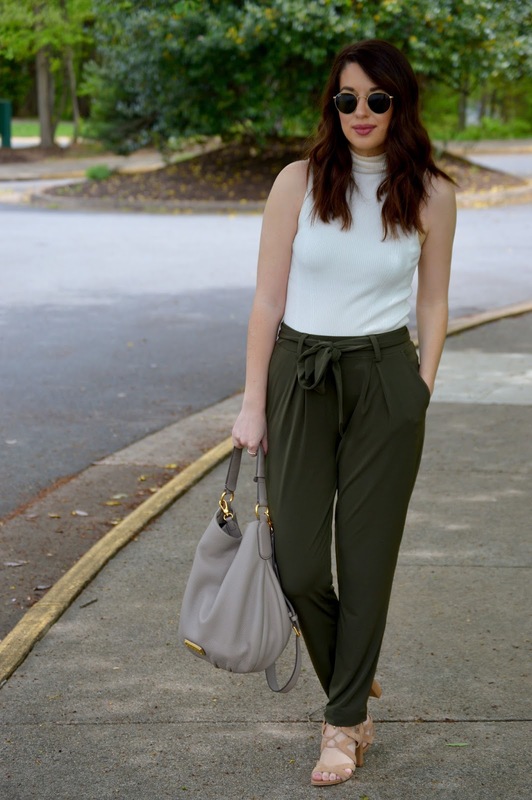 These pants are so cute and you are right, so perfect for work or casual! I can't believe wedding week is here! Good luck with all the last minute things, this week is going to fly by! I need those pants in my life. Period. You look amazing and this was styled effortlessly! You look amazing! Love those olive joggers! Yay for wedding week! Ekkk so exciting! Those pants look super comfty! I just browsed through Express this week. Looks like I need to go back. I haven't tried spray tanning yet. Have a happy wedding week! These trousers are SO cute on you! I'm a total olive fan, so I wanna try these! Okay I am OB-sessed with this look! Simple yet so chic! Congrats on wedding week! I had a spray tan the Friday before my friend's wedding and we all loved it! Just exfoliate the day before as if you're leaving a crime scene and wear really lose clothing after! YOURE GONNA BE GORGEOUS! And Thank you so much for linking up with On Mondays We Link-Up! The airbrush spray tan is so much better and I have never had any issues. Congratulations on wedding week! Ah!!! How exciting, girl! Enjoy every moment of this week, cherish it and soak it all in. As for your outfit, I love those pants! The color is so beautiful and they look so good on you. I also love them paired with that gorgeous taupe MJ bag! Thanks for sharing, beauty, and I hope you have a wonderful day!